It has been way too long since I posted a good Thai dish. I don’t know about you, but I crave good Thai food at least once a week, if not more. Living in Seattle, it’s not hard to find good Thai food (or Vietnamese Pho for that matter). I would almost go as far as to say, there is probably a Thai and Pho restaurant on every other block in the urban areas of town. We happen to live one block from a really great Thai restaurant and last week when I was sick, I got some take-out soup from there. Simultaneously, I was in bed reading the new issue of BonAppetit Magazine and spotted what looked like a phenomenal recipe for Thai Basil Beef over Rice. I ripped it out and put it in my kitchen, knowing that I was going to make some version of it once I was back on my feet. Fast forward not even a couple of days and these Thai Beef Lettuce Wraps graced our dinner table. The original recipe is meant to have more of a sauce and be served over rice but I changed it around a bit and adapted it to become lettuce wraps. These are perfect for a quick mid-week dinner and as long as you keep the spice level under control (see NOTES below for more on that), toddler and kid-friendly. If you want this spicy, try to get a red Thai chile. For a more mild flavor, a red jalapeno will work. Since chilies can really vary in spiciness, smell or taste a tiny piece before you decide how much you want to use. I used half a large red jalapeno for the entire recipe and it was mild. I did this so my son could enjoy it (which he did!) but personally, I would have liked it much spicier! Feel free to sub fermented soy sauce or Tamari for the coconut aminos, but if you are trying to avoid soy and can’t find the aminos in your local stores, Amazon sells it for a reasonable price! I’ve been trying more brands of Coconut Palm Sugar and have found that Wholesome Sweeteners is a good value (at least online!). I am really liking Red Boat Fish Sauce as it is exceptionally high quality and made in a traditional fashion without any added water, preservatives or MSG. As for lettuce, use any rugged leafy green lettuce. I used Organic Iceberg but Boston Bibb or Butter lettuce or even crisp Romaine leaves would work! Thinly slice scallions (both white and green). Thinly slice red chile. Clean basil leaves and place into a single stack. Roll and then thinly slice (chiffonade). Clean carrots, peel and julienne. Squeeze lime juice into a small dish. Drain and rinse water chestnuts and roughly chop. In a small bowl, mix together coconut aminos, fish sauce and palm sugar until sugar is mostly dissolved. Combine scallions, half of red chile, 2 cups of basil, carrots, lime juice, 1 Tablespoon of oil and a pinch of salt in a bowl. Toss until well coated and refrigerate until ready to serve. Heat a large frying pan or wok over medium high heat. Add 1 tablespoon of oil. Once hot, add all of the sliced garlic and half of the sliced red chile. Cook for 30 seconds, stirring constantly. Add chopped water chestnuts, continue cooking and continuously stirring for 30 more seconds. Now add ground beef, kosher salt and black pepper. Cook 8 to 10 minutes, until beef is cooked through and no pink is visible. 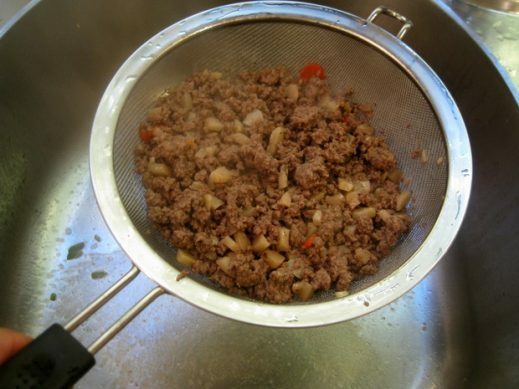 Drain beef through a fine mesh colander and return to pan. Continue cooking for 4 to 5 minutes over high heat to try and brown some of the meat and let it crisp up a bit. Add 2 cups of the basil leaves and the fish sauce dressing, cook for 1 minute, stirring, until wilted and fragrant. Remove from heat, place in a serving dish and serve with the carrot slaw and crisp lettuce cups. Enjoy! I found this recipe last year after trying so many that were missing a hint of this, a splash or that or were just off. THIS IS THE MOST DELICIOUS ONE EVER! So thank you so much for the gift of yum. I printed this and kept in my pantry until Harvey decided to visit. I will admit up front, I am not the most organized person out there, so no, I did not have this book marked. I just spent the past 2 hours going through google search results for “thai lettuce wraps” and was giving up home until I saw the most beautiful website name: EVERYDAYMAVEN.COM! These are just that good. I will never lose you again, I promise! This recipe is fantastic! We use ground pork and raw cabbage leaves (red or green). Very, very good, thank you for the idea! Have made these several times and they are amazing! Quick and easy recipe that can be varied for produce on hand. I have added cilantro or red pepper to bolster up the slaw when I ran low on basil and it was still wonderful. Love you recipes! These wraps look scrumptious, Alyssa! Lettuce has become our go-to bun/wrap substitute, and filling it with Thai beef sounds divine. Hope you are feeling better now! So my take home message is that I’ll need to get sick and take to bed in order to slog through the foot high stack of magazines on my ‘to read’ list? I love the additional pictures to explain the recipe – so helpful! This looks yummy and healthy, thanks for sharing. Like your lettuce substitute for the rice great choice. Thanks Norma! The lettuce adds a nice, cool crunch to the contrast of the hot meat – really tasty! Lettuce wraps are so good, and something I don’t make nearly enough. I love Thai, so of course I’d love these. Super flavor – thanks. I love lettuce wraps, one of my favorite Thai dishes! I love lettuce wraps – especially for my gluten free diet. I am with you – they make a perfect starter or light dinner! I am ALWAYS up for Thai food and Thai flavors! These lettuce wraps look fabulous! Me too Joanne – these are easy to eat and go quick!